Home|Israel and Palestine: A Dialogue of the Deaf? Israel and Palestine: A Dialogue of the Deaf? "Dialogue of the Deaf: A discussion in which each party is unresponsive to what the others say." The past two weeks have seen the onset of a new cycle of violence between Israel and Palestine. To date, this cycle has claimed the lives of tens of Palestinians and Israelis. As the violence wages on, both Israel and Palestine have turned to social media in order to offer their interpretation of events. From a research perspective, this use of social media offers a glimpse into how nations use digital diplomacy in times of crisis. According to Israel’s narrative, Palestinian incitement has brought on the current wave of terror. This incitement is both secular and religious. The secular incitement originates from the Palestinian leadership in the West Bank. The religious incitement originates from Hamas who target Israelis because they are Jews. The joining of the Palestinian religious and secular leadership is an important part of Israel’s narrative, as it demonstrates that when it comes to inciting violence against Israelis, there is no difference between the Palestinian government and religious zealots. Interestingly, while Israel alleges that both Hamas and the Palestinian Authority incite against Israel, it is Palestinian President Mahmoud Abbas who is identified as the cause of violence. In a series of tweets, Israel’s MFA claims that Abbas refuses to denounce terror, that he incites terrorism by naming streets after terrorists, and that his combative speech at the recent UN General Assembly urged Palestinians to act violently. This may be an attempt to rally international condemnation of Abbas, which in turn would validate Israel’s claim that he is no partner for peace. Morality plays three roles in Israel’s narrative. 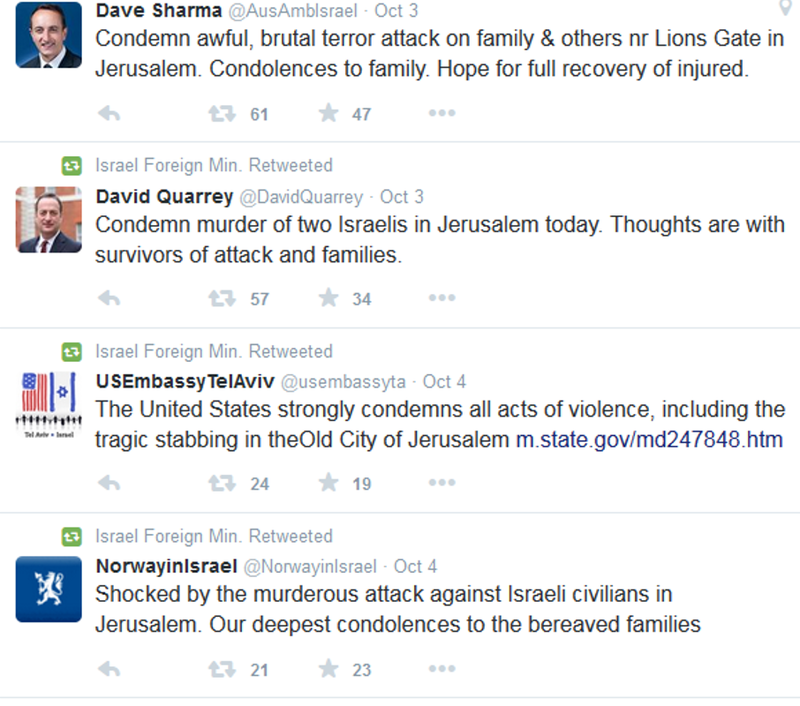 First, the MFA uses Twitter to highlight Palestinian immorality in light of recent attacks on families. Secondly, Israel retweets messages by world leaders and diplomats which condemn Palestinian terror, thus demonstrating the world’s collective condemnation of the Palestinian government. Finally, Israel depicts its own morality by detailing the amount of humanitarian aid delivered daily into the Gaza strip. According to Israel, the only solution to the crisis is a Palestinian crackdown on suspected terrorists. Analyzing Palestine’s online narrative is a demanding task, given that the Palestinians currently have two governments: the Hamas government, which rules over the Gaza strip, and the Palestinian Authority, which is situated in the West Bank. Thus, in order to fully analyze the Palestinian narrative, one must analyze both Hamas and Palestinian Authority feeds. According to the Hamas government, the current cycle of violence is essentially a struggle over the fate of Jerusalem, which has long been at the center of the Israeli-Palestinian conflict. In a series of tweets, Hamas officials have stated that the battle over Jerusalem has officially begun and that Hamas plans to take an active role in this struggle. Interestingly, Hamas seems to be attempting to rally international condemnation of Israel, as the protection of religious rights is now an important global topic. Likewise, these statements present this conflict as one that is relevant to all Muslims. As such, these tweets are quite similar to Israeli tweets that attempt to galvanize international support against Palestinian terror. What is most surprising about both the Israeli and Palestinian social media narratives is that they seem to ignore one another. Like Israel, Hamas employs moral arguments in its narrative. Over the past week, Hamas has tweeted images and videos that allegedly demonstrate Israeli violence against Palestinian women and children. Another tweet dealt with Israeli Prime Minister Netanyahu’s claim that Palestinian social media activists are using these platforms to incite violence. Hamas may have highlighted Netanyahu’s statement in an attempt to depict Israel as country that censors freedom of speech, thereby attacking Israel’s self-depiction as the only democracy in the Middle East. According to Hamas, the solution to Israel’s attack on the Al-Aqsa mosque is a Palestinian popular uprising. The “popular” aspect is a crucial element of Hamas’s narrative, as it evokes connotations of the Arab Spring. In this way, Hamas is framing recent attacks as a democratic revolt rather than as acts of terrorism. Surprisingly, the official media center of the Palestinian Authority has tweeted only messages with regard to current hostilities blaming the Israeli government for invoking violence. This is not the case with the PLO’s delegation to the U.S. On its Twitter channel, the delegation attacks Israel through moral and legal arguments. For instance, the delegation claims that Israel’s recent killings of Palestinians were similar to an "execution style" murder, or had an "extra-judicial killings and execution style." Such legal arguments carry much weight nowadays as Israel is often the subject of international tribunals, such as the 2015 Gaza probe. By suggesting that Israel has "executed" Palestinians, the PLO delegation may be able to push for further legal investigations of Israel’s military conduct. What is most surprising about both the Israeli and Palestinian social media narratives is that they seem to ignore one another. Hamas’ English tweets do not contend with the Israeli claim that the cause of violence is Palestinian incitement or religious hate. Israel’s tweets do not contend with the Palestinian argument that recent attempts to alter the status quo on the Temple Mount are the root cause of current animosities. Effectively, both sides are depicting staggeringly different realities. This may confuse social media followers from abroad, as they are unable to reconcile the differences between the two realities. Effective digital diplomacy may therefore include more than just getting one’s message across. It also includes countering opposing arguments and claims, thereby winning the debate. Anything else is simply a dialogue of the deaf.